Leonardo struggled with Math. So says biographer Walter Isaacson, citing DaVinci’s notebook entry doubling 4,096 to get 8,092. I take satisfaction in knowing the great thinker didn’t get carrying the one. I recall standing at the blackboard as a befuddled second grader, wondering what to do with the superfluous digit. My exasperated teacher rubbed my head into the board, asking “Don’t you see it!” “No, and having my head pushed into slate doesn’t help.” I thought, but dared not say. That episode didn’t instill in me a love for math or numbers. I eventually got hold of the carrying over the one idea and became marginally competent in basic math. Adding and subtracting whole numbers became easy enough, as did multiplying and dividing. By fourth grade I was pretty sure this was about all I was ever going to need. Then came algebra, or as Isaacson calls it, “that wonderful tool for codifying nature’s laws and variables . . . ” Uh, okay. Again, it is comforting to know DaVinci was clueless when it came to algebra. What DaVinci did appreciate was geometry, but I’m not good at that either. Too many “givens” for my taste. I like to know why something is a given, rather than being told it is a given. I’m bent toward the philosophical. One of the things in math classes that did intrigue me were word problems, though I had mixed success with them. The ones where a train left Boston at such and such time and clattered through three different time zones with several stops, and blah, blah, arriving in Los Angeles at what hour, could be challenging. I figured the whole thing could be solved by flying, but then I like airplanes. These word problems, while difficult, incorporated story, and that was much appreciated. A bundle of chalk-scribbled numbers on a blackboard had no story for me, only cold, soulless numbers. Geniuses tell me how beautiful math is, but I guess I don’t quite get it. The story thing I get, so word problems at least helped me appreciate why we were doing this. Describing Leonardo’s math struggles, Isaacson introduced Luca Pacioli, of double entry bookkeeping fame (though he did not invent it). Pacioli had a side gig compiling riddles, parlor games, and mathematical brain-twisters. I felt a warm glow when he wrote about Pacioli’s little brain exercise involving the safe conduct of a wolf, goat and cabbage in a little boat that could carry only a farmer and one passenger at a time. Reading that sparked a memory. My dad used to bring this little game up at parties. Dad had a small repertoire of puzzles and brain-twisters. I found them fun and always good exercise for the mind. Another of dad’s amusements was to ask guests the identity of Al Capone, John Dillinger, or a list of other notorious figures, ending with Giovanni Montini. Everyone could readily recall all but the last, upon which dad would mildly chastise the company for knowing gangsters and Jezebels, but not the Pope (Paul VI). It was, I suppose, a more innocent time. 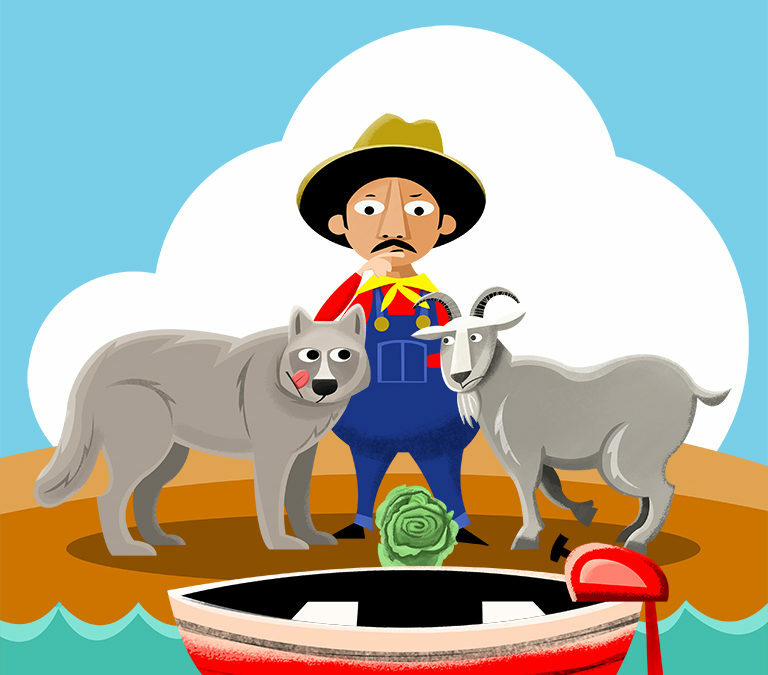 Anyway, recalling the wolf, goat, and cabbage exercise made me smile and put me in the mood to draw the scene as it might appear in a kid’s workbook. Please share your answer to the problem. While you’re at it, tell me what time that train gets to L.A.